Since we hang our hat on excellent customer service, you can expect a little more from our technicians. 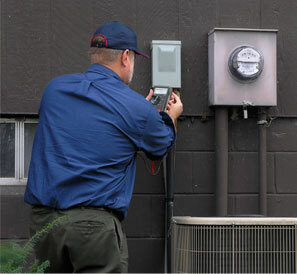 They are highly skilled and can fix your furnace or air conditioner fast. They are trained to work on all makes and models and they fix it right the first time. What more could you want in a technician? How about friendly and respectful? Trustworthy? Neat? With a Pinnacle technician, you get all of that. All of our technicians are background checked and drug tested. You never have to worry about who you are letting into your Wellesley home. They will treat you and your home with respect and leave your home as neat as they found it. You’ll love our service and you’ll love our technicians. One of the things our Wellesley customers like the most is our flat-rate pricing. While our technicians provide excellent service, we don’t believe it should cost you more. With our flat-rate pricing system, our prices are fair and competitive. Our technicians will diagnose the problem and give you an estimate before any repairs are done so there are no ugly surprises. At Pinnacle HVAC, superior service at a fair price has kept our Wellesley customers happy since 2001. Call us when you need furnace or air conditioner repairs, installation, or maintenance at (781) 647-7117.